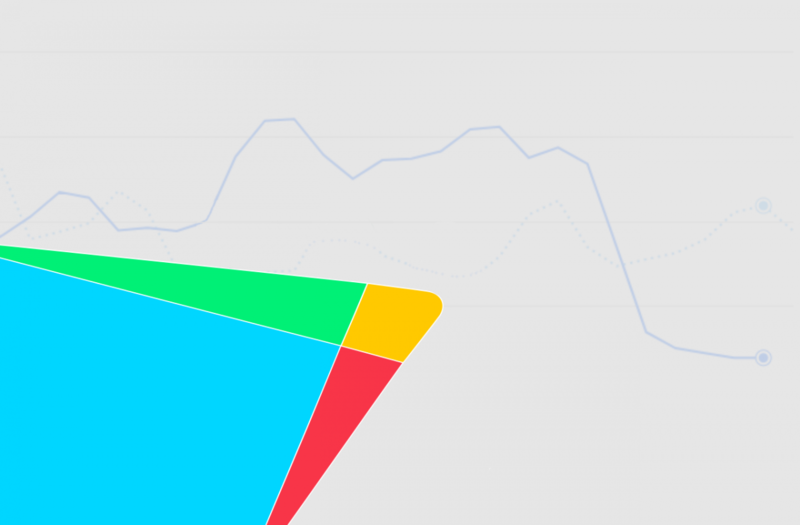 Some Android app and game developers are panicking because their daily installation rates have plummeted in the past week. These developers have noticed new downloads slow down by up to 90%. The affected developers quickly realized they were not alone in these changes to their day-to-day app installation rate with multiple threads on Reddit, a post on the Unity forums, and even a Gamasutra community blog post popping up to help spread the word that something was amiss. Clearly, something is wrong here, and some indie developers are concerned that their livelihood may be at stake. So what’s going on? It appears that sometime last week, Google tweaked the Play Store’s algorithm that determines app discovery. When we reached out to Google about the matter, we were told that Google is regularly evaluating new ways to improve the Play Store’s ranking algorithms to promote high-quality applications. We would like to stress that there is no evidence that Google is altering the algorithm to intentionally harm indie developers in favor of big-name apps (despite rampant speculation otherwise). The changes are aimed at improving the experience for both users and developers alike. We do not have any details on exactly how the algorithm was changed (which makes sense, as disclosing that information would give an unfair advantage to certain developers) but it’s clear that the changes are making a significant impact on some independent developers. 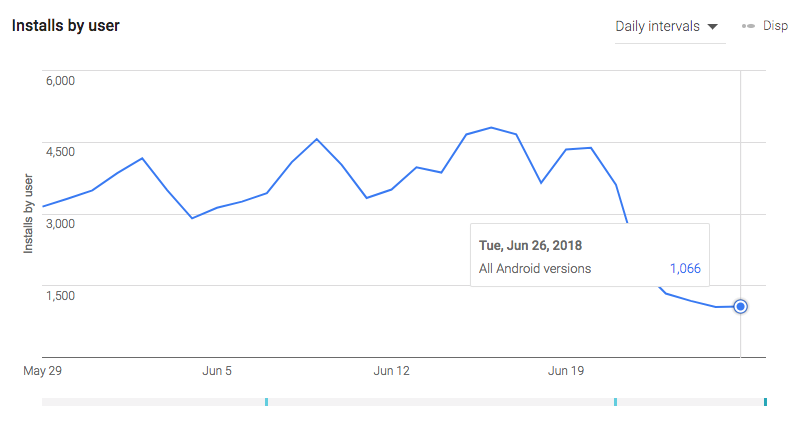 The screenshot shown above is from the Developer Console statistics for a game called “PickCrafter.” The developer graciously shared their Play Store installation metrics with us to demonstrate the issue. As you can see, the app hovered around 3,000-4,500 daily installs until the past week when the rate dipped into the low 1,000s. This developer isn’t alone by any means. We’ve heard numerous anecdotes from independent developers over on a dedicated Discord group for the issue. They all told us the same story – starting last week their app’s daily installation numbers tanked and haven’t recovered since. Although most of the affected apps appear to be Android games, several non-gaming apps have also been affected. We do not have any details on how many games versus non-games are affected. Developer peanutbutterlabs reports that their daily downloads dipped to 5,000 from an average of 80,000 per day. Developer Butterbean21 reports an 80% drop in their top-performing apps. Developer Jenzo83 reports an 80-90% drop for their games. Developer snoutup reports their rates dropped by “only” 70%. Developer llliorrr reports an 80% drop for 28 out of their 30 apps. Developer AxPetre reports a drop in installation rates from 12,000/day to 5,000/day. Developer slothinspace reports a drop from 1,500+ downloads to 100+. Developer janikkk reports an 80% drop. Developer zenderfile reports a drop from 12,000/day to 1,500/day. Developer livenets reports a drop from 32,000/day to 4,000/day. And here are some additional screenshots that show a significant drop in installation numbers, courtesy of Redditor alpha724. For what it’s worth, XDA-Developers‘s very own Navigation Gestures app has been unaffected by these changes. However, we’re fortunate in that we would be able to survive a change in the algorithm affecting our rankings – after all, we have a strong following on the Portal, our YouTube channel, our Twitter account, etc through which we can promote the app. Independent developers who rely on organic growth via the Play Store don’t have access to such an audience without spending significant income on advertising, so these affected developers are worried that the changes may harm their apps’ success. Developers that rely on ad views for income are especially concerned with the changes since their revenue is directly dependent on the number of ad impressions they get. What May Have Caused These Drastic Drops In Numbers? Developers on the Unity forums have eliminated several possibilities behind the changes, including inaccurate installs reported on the Play Developer Console, issues identified through Android vitals, search rankings, summer exams, and the FIFA World Cup. One possible cause behind the issue that has been identified (and which we can confirm) is a mismatch between an app’s category, description, and content with the apps shown on the “Similar Apps” panel. 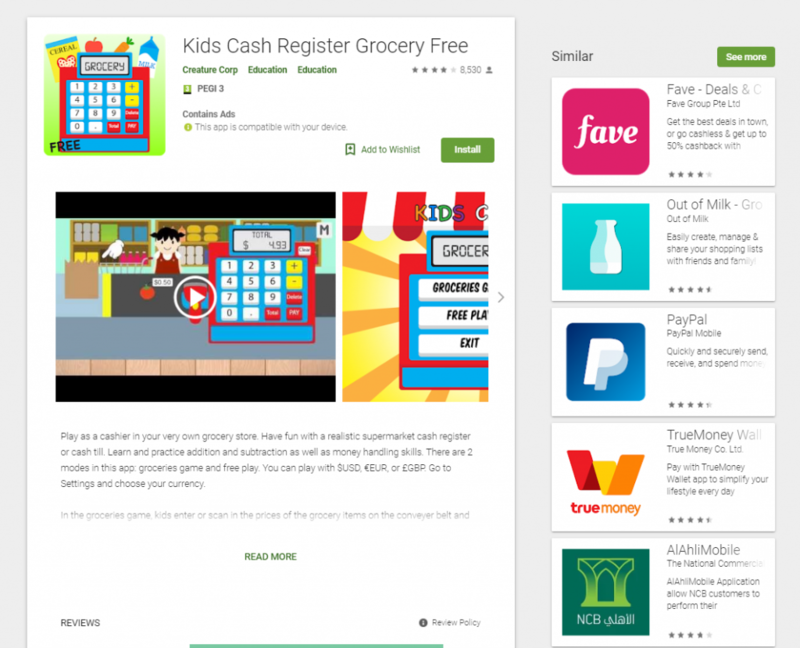 As you can see below, a game called “Kids Cash Register Grocery Free” has a rather odd assortment of “Similar” apps shown for it. Likewise, another issue seems to be that certain categories aren’t loading for desktop users in certain countries. For instance, the “Casino Games” category fails to load for me and several others in the United States and Canada when browsing the Google Play Store on desktop Google Chrome. However, the category does load appropriately on mobile devices and the Play Store accessed from a Chromebook. We doubt that this particular issue is contributing significantly to the drop in numbers that developers are experiencing, but it’s certainly one possibility. We do not know if the changes are permanent. Regardless, this should be a clear wake-up call for indie developers that any slight change in the Play Store’s ranking algorithm can significantly impact your app’s success. Developers are encouraged to proactively improve their app’s quality. Google has published recommendations on how to do so on the Android Developers Blog and Quality Guidelines documentation page. If Google tweaks the algorithm again or makes a public statement on the matter, we’ll be sure to let you all know.